Check out this time lapse video of SSE’s project of zero carbon homes they have built in the South of England. Staff were afforded the opportunity to live in these homes at a lower cost than regular living arrangements for a year and could live within a completely zero-carbon free home. What do you think about these types of homes? Do you see them becoming more popular than homes as they are now? Let us know your thoughts in the comments section. Simple Steps to a Greener You! As the world becomes a more environmentally and ecologically challenged place more people are now questioning what they can do to make themselves more green. What changes can they make so that they can help make an impact on the environment? Allow us to help; we have put together this list so that it can help you make some small changes that can make a big difference. Many companies now offer a green tariff and aligning yourself with one of these companies will help you make a difference to the environment. There are many UK energy companies that you can choose from and sites such as USwitch which can help you choose the one that you feel will most benefit you and the environment. The image above shows a search I completed for my property by entering all my details such as my energy spend per month, where I live and I can sort out my results by price or service rating. 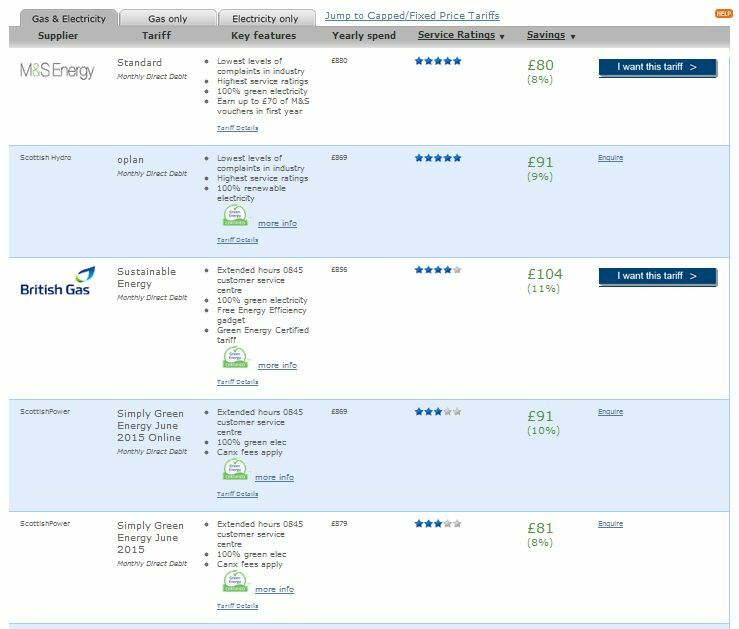 It then allows me to see what the key features are for each tariff and how much Co2 can be reduced from previous tariffs. Broken appliances can be a drain on the pocket. Machines such as tumble dryers, dishwashers and fridge freezers can impact your bills when working properly but if they are faulty then this can have a further impact. Getting an appliance engineer in is useful as they will be able to mend any issues that the appliance has and will save you money and help the environment by using less energy. Also where possible use AAA rating products as they are most efficient. Not all changes have to be massive. By changing your homes light bulbs to energy efficient light bulbs you could potentially save as much as £20 per month – or £60 a quarter. Whilst helping your pocket these will also omit less Co2 and help the environment too. Food wastage is quite a large issue and one that most people could hold their hands up to. When families buy too much food and it then goes off then this waste generally ends up in the bin and then a landfill site. Large amounts of food wastage produce a large amount of methane gas when deposited on these sites and this is a harmful greenhouse gas. Planning meals for the week and eating food before a sell by date can help temper this problem. In a plan to cut carbon emissions power stations around the UK are being encouraged to burn wood in order to cut carbon omissions. The UK Government argue that burning “biomass” is a carbon neutral process and will offer subsidies to stations which start using wood to produce power instead of coal. One of the country’s largest coal fired stations, Drax, is aiming to replace half of its coal energy output and replace with biomass. Eggborough, in North Yorkshire, plans to replace all its coal with wood burning energy production. The amount of biomass that has been burned for electricity production has doubled in capacity in the last 12 months to approximately 3 million tons and it is thought that this will increase to near enough ten times that amount by 2017. This means that most of the wood that will be burned for energy in this country will be imported from abroad; already half of current biomass stocks are imported. However a report from the RSPB, Friends of the Earth and Greenpeace declares that the amount of carbon that is produced when burning wood is higher than that of coal per unit of electricity. The reason for this is due to the fact that newly cut wood is wet and bulky which means that carbon has already produced through transportation to the power stations as they source wood from as far away as New Zealand as well as having to dry the wood out. Also as wood, in weight, is half water so the amount of wood required is far more than you would need to produce the same amount of energy with coal. Even when the trees are replanted the amount of time it would take to offset the amount of carbon already produced is too great to make a difference. So what do you think about biomass energy production? Please feel free to leave a comment below. This morning we have been listening to this interesting programme from the BBC World Service Business Daily – focussing on changes within the world energy market. 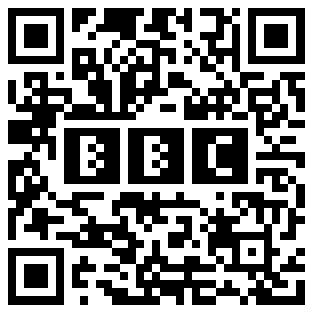 You can listen here or scan the QR code below. Ok so this may be a little early but it’s definitely best to make these changes before the real cold kicks in. The plan is, the more money we can save by being energy efficient the more partying we’ll be able to do when the festive holidays kick in. So in light of this idea we have created a great little guide for you that will help you save money in all the right places. The most important thing to remember throughout the cold period is to keep warm! Rather than crank up the central heating try putting on an extra layer of clothes. In fat you are actually better with lots of thinner layers as opposed to one big thick layer. Depending on how far you want to take the money saving you could also try keeping blankets out for snuggling into when you’re sitting watching TV. These are as old as time and yet they’re still a great investment. The trick is to make sure you use them right. Personally I like to put it in my bed about 15 minutes before I go, and it makes things lovely and warm. Timers are a great way to save money as they allow you set things to only come on at certain times. So for instance rather than leave the heating on all day just so it’s warm for you coming home, you would set your timer to turn the heating on an hour before you get home and an hour before you get up in the morning. A well known fact is that you can save as much as 10 percent on your heating bills by turning the thermostat down by as much as 1°C. Overall though you want to keep the thermostat between 18°C and 21°C. Is ‘going green’ still too expensive? Encouraging businesses to green their fleet vehicles and persuading them that it needn’t be an expensive exercise has proved problematic in recent years. However, with the advent of increasingly advanced green-tech in cars, combined with more appealing designs – this thought process is beginning to change. Couple this with announcements from Chancellor George Osbourne at the last budget, businesses now have little choice but to begin to take the emissions levels of their fleets seriously. Indeed, as leading UK fleet management system supplier Fleet Alliance reports, it is now much more common to witness larger firms and public sector bodies making serious efforts to ensure that their fleets are more environmentally friendly. Anyway, to go back to the budget. In the last UK Government budget, the Chancellor underlined the government commitment to lower carbon vehicles, by reducing the CO2 emission thresholds – with higher tax levels for those vehicles that do not match these levels. The full list of levels can be seen in this PDF file. From April 2013, the carbon dioxide emissions threshold for the main rate of capital allowances for business cars will reduce from 160g/km to 130g/km. The threshold above which the lease rental restriction applies will also reduce from 160g/km to 130g/km. Of course, this means that many fleets will be looking to transition this vehicles with this level of emissions. With approximately 25 % of the total UK carbon emissions attributed to transportation, do you feel that these levels are low enough to make a dent? As always, we welcome your opinions in the chat section…….